There are fewer things I hate more in this life than the boquet toss at a wedding. Coming from a town where most go from turning their high school tassel to turning back their wedding veil, walking out on the dance floor to catch a boquet at the ripe old age of 26, is the equivalent to 30 seconds of free babysitting. Nevertheless in the spirit of good-naturedness, wedding after wedding, I will dab on some ben gay, pull up my support hose and gather on the floor with a passle of 16-year-old hopefuls while the ever-clever Beyonce's "Single Ladies" blares out. Am I the only one who doesn't love this tradition? Is this really fun and I'm just not getting it? You'll be happy to know that I didn't do the bouquet toss and garter toss at my wedding. :) We did an "anniversary dance" instead, where the DJ called all married couples out onto the floor to dance, and dismissed them like "if you've been married less than 24 hours, please sit down", etc. The couple who was married the longest got the bouquet. I liked that much better. I think it's just a tradition that most women feel like they should do, but I agree...it's not the best feeling ever!! I don't like it, and my best friend tried to 'make' me catch hers and I let another girl go in front of me lol. I like the idea of the Anniversary dance--my sister did that at her wedding, too! NONE of my friends are married or engaged yet... seriously... none. Nick's best friend got married last summer but that was the only wedding I've been to in a long time. I am sure in a couple years all my friends will be dropping like flies, and I will feel the exact same way though. I hate, hate, hate the bouquet toss. I have an engaged friend who considers the toss to be one of the most important parts of her wedding (her hurrah, if you will) so I will be "enjoying" that tradition in a few months. I have probably only been to five weddings in my whole life; three were when I was an adult. I never caught the bouquet. I still ended up getting married though! It's funny you say that because, my friend yesterday asked how fun it was for me to toss my bouquet and I said it really wasn't ....I'm not into the tradition either! you are not the only one who doesn't like it. i'm 19 and i really hate doing that part of a wedding. i'll sit happily on the side lines and watch of course, but i REFUSE to participate. trust me...you are NOT the only one. i despise this "tradition" and probably won't have any single ladies at my wedding so it probably won't be done. i usually either a) leave before this part of the night takes place or b) hide in the bathroom. who needs tradition...do yo own thaaang!! but ashley...when you get married, you betta be wearin that garter! and better make your groom pull it off with his teeth..GRROWLL! thats a tradition you need. HAHA!! I agree with you 100%. That's why we eliminated the bouquet and garter toss on our wedding day. could be my favorite post you've ever written and this is saying a lot. I hate this shiz. ugh. I'm with you. We didn't do the bouquet/garter toss at our wedding - cheesy and awkward! i think it's more fun when you're a teenage... i went to a wedding this past weekend. my sister-in-law's dad told me to stay away from the bouquet. ouch? As a woman who works weddings every weekend I feel you on the Single Ladies... someone really needs to think of a better song! And if one more dude dances with his mom to Rascal Flats I might just have a conniption.... but I do think the toss is something the younger brides do more than the older ones... rest assured, as you get older your friends stop following all the traditions...but you are so beautiful inside and out and I'm sure that you won't be on that dance floor much longer! the last wedding i went to was just after my beau and i just turned 29. he asked if i was going out to catch the bouquet and i looked him straight in the face and said, "do you know what it's like to be pushing 30 and still hearing Cyndi Lauper's voice while I pretend I'm happy to be elbowed in the face by desperate girls? i'm going to the bar." I think the idea was sweet back in the day but kind of outdated. There are always the two groups...girls that are gonna DIE if they don't catch it and girls that don't want to be there. yeaaaah, it gets old. not really a fan of that - i def. feel awkward being engaged and people making me join the bouquet toss. um, no, thank you. p.s. i HAD to laugh at that particular time of "your hometown." HAHA! love it. I didn't do the bouquet toss or the garter toss at our wedding! I think weddings are more nontraditional these days anyway! Throwing my flowers that I paid a fortune for wasn't going to happen... and i wasn't going to invest in another bouquet to toss, because well that seemed pointless. Garter Toss?? Um I can't say that I'm comfortable with my grandma inlaws, and pastor watching my husband reach his hand up my dress! I don't find them a bit fun! Okay so... I don't have the same view on the bouquet toss as most girls. I am mostly in it for the competition! I love to take girls out on the floor! OMG glad I am not the only one. I don't necessarily hate the tradition but I never participate I get in the back and actively try to NOT catch the bouquet. I don't even have a freaking boyfriend why would I try to look so desperate and catch a bouquet and start dreaming of my make believe fantasy wedding with my non-existant boyfriend. I just don't feel the need when I don't have anyone to wed to attempt it. Plus the girls that act crazy and scrap over the bouquet are far more fun to watch than trying to actually catch it. hahaha i love all the comments! i am a lover of tradition so don't hate me but i all all for it! but i mean maybe my views are out of date, i havent been to a wedding in FOREV! You are not alone! I HATE it! I always hide in the back. I hate the bouquet toss too! It's so embarrassing- not just to be singled out for being single, but especially when they want you to "fight" for it. No thanks! I like the Anniversary Dance idea though! i put "girls just want to have fun" for my wedding toss...does that make it any better? you will definitely meet mr right and he will be SO lucky! Oh I hate the toss, so much that I hide or relocate until it's over. I don't think I'll do it when I get married. Maybe it'll be a woman toss only. Hahahaha, you are SO right! It really is totally awkward. It was fun when we were young, but I don't think it's fun as women age! Haha. This is hilarious. It can get a bit awkward during it. Especially if you've got some drunk guests throwing themselves allover the floor to catch it. We didn't do the garter toss bc I just felt way too awkward for that one. I hate that tradish with a passion. Oh girl, you read my mind. I seriously HATE the bouquet toss. And your line about the tassle and the veil is so true. I seriously make my table PROMISE me that they will not point me out and that I can sneak out to the bathroom when the toss occurs. This happened after I ended up having to catch the bouquet at my ex boyfriend's wedding amongst a bunch of 12 year olds. NEVER again. I completely agree!! I'm so not into the bouquet toss!! Some things need to go! Honestly, tradition schmadition. Let's update things a little, shall we? I HATE THE BOUQUET TOSS!!!!! Talk about an awkward moment where no one wants to do it but you feel bullied into it. So with you on this one. I only find this fun when I have a group of friends to head out there with. Otherwise it's extremely awkward! 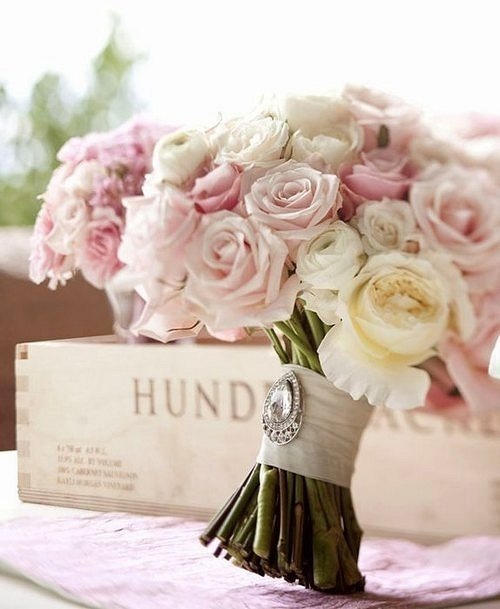 Okay, that bouquet is GORGEOUS!